PT is a good idea, though finding one that looks good is difficult, as they seem to select the ugliest pieces to treat. The new treatment doesn't like epoxy all that much. If you can get commercial purchasing arrangements, you can still get the old CCA treated stuff, but this isn't available at the retail level. CCA treated works with epoxy. Yeah, you can try talking to a dock builder. They have permits to use the CCA material. Any contractor can get it, though many places insist you have a commercial account with them. For a couple of pieces, you can get a good selection for a 12 pack, though most dock builders and contractors I know just get what's available, which is most commonly CA. I started in on it yesterday and learned a few things. 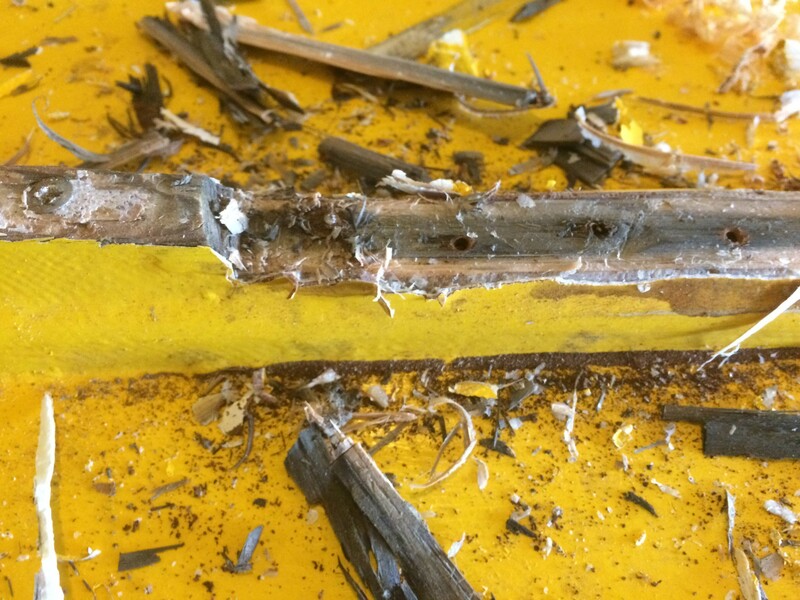 1) The keel looks like it could have been a really clean 2X4 ripped to about 1" thickness. It even looks like it was doug fir. If it wasn't a 2X4, it's certainly along those dimensions. 2) It looks like it was primed and painted only. Little evidence (yet) that it was coated with epoxy. Just primer and paint. I've only got about 1/3 of the top cleaned off. I'll keep peeling back the paint to the hull and see how it looks. There could have been one light coat on it. 3) The skeg keel looks more like 1X2 stock that was shaped (again--speaking to the dimensions here). It was epoxied onto the keel and then fiberglassed. It had two "runners" but they were notched out and inserted to align with the trailer rollers. Given that these are often viewed as sacrificial, I guess I can see the reasoning of using just steel but the rust really did a number on the wood under it. 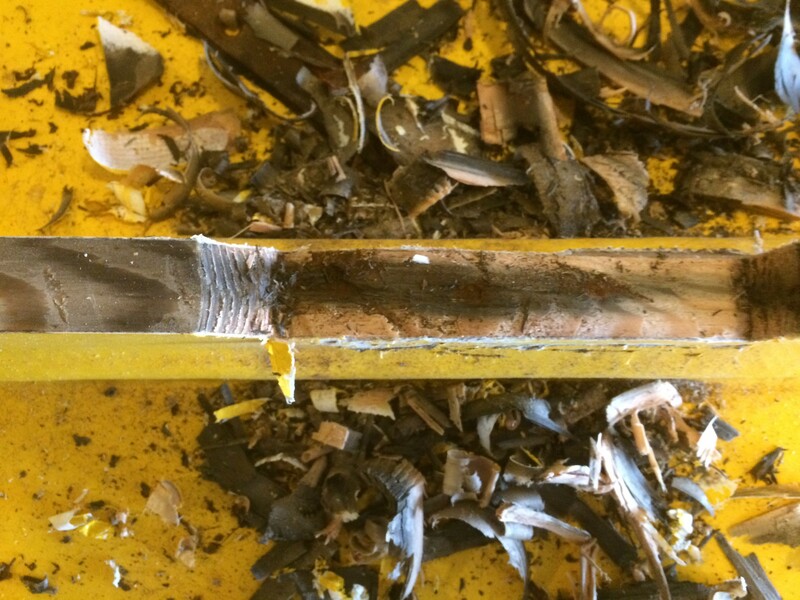 The downside of course is that the keel is only needing to be sacrificed because of the damage done by these two metal strips. I'll put a runner the length of it when I replace it and use something rust-proof. This might be a good place to use bronze or the like because it is hard enough to support the weight on the trailer. After looking at it for a couple of days, I think I'll cut the whole thing off and start fresh. The front 1/3 is pretty hammered, and the back 1/3 as well. So here's the question--why not put several layers of epoxy on it to help toughen it up? No glass, just epoxy. Is it because it will hold the water in if any does get in there--which is certainly possible given the # of penetrations from the runner (even if sealed well)? Bryan - I'd epoxy the keel/skeg even if you expect the trailer to grind the epoxy off in spots. I wouldn't glass around the tip of the keel or skeg - you would have to put a nearly full round radius on the skeg to be able to wrap standard fiberglass around it - and then you couldn't put a metal strip on it. I wouldn't have any great heartache about using douglas fir for the keel & the skeg though white oak would wear better. I think the oak holds fasteners better even when wet. You would want to put several coats of epoxy on it - one to soak in & then two to add thickness to the layer. I would epoxy the skeg & keel directly onto the hull. That way the fasteners used to attached it don't get wiggled around creating a leak path into the hull. I you ever need to take it off you can sand it down flush with a electric disk sander pretty darn quick. Any thoughts on using 2 pieces for the keel scarfed together? (Just thinking that I could get an 8' piece and rip it for the 3 lengths I need vs getting a 12 footer. And might be easier to find a piece with good grain all the way if shorter? As long as you do the scarf joint at least 8 times as long as the height & make sure you don't starve the joint of epoxy it should be fine. Don't starve the joint means get the wood wet with straight epoxy first, let it soak in a few minutes, then add epoxy thickened with fibrous thickener ( I use some West System stuff but I can't remember the name right now or even very fine sawdust but not micro balloons ), clamp firmly but not as hard as you can and let cure. You need to keep it straight while it cures as the viscosity of the epoxy will drop as it self heats during the curing process - which can make stuff slide around. If you don't wet the wood first the wood can pull the epoxy out of the filler making the whole joint dry & weak. Clamp it between blocks with saran Wrap in between so you don't glue the blocks on. Then sand smooth & use. I might do something pretty on the bow section, but yeah, the flat SS bar might do the trick on the keel and skeg. And onlinemetals local pick up is a great idea too. Thanks! This is what was under the "roller guards" on the skeg. I carved some back to see the extent of the bleed from the metal an screws. This is part of what made me decide to just cut it off. Which I hope to do this weekend.
. . . So here's the question--why not put several layers of epoxy on it to help toughen it up? No glass, just epoxy. Is it because it will hold the water in if any does get in there--which is certainly possible given the # of penetrations from the runner (even if sealed well)? Epoxy alone doesn't add much toughness, nor abrasion resistance to a piece of wood, particularly softwoods. Fabric and fillers toughen up epoxy, though to some degree several coats (not just 3 or 4) can add to toughness, but nothing like fabric and fillers. I've gotten my hands on Kevlar dust and fibers, which when mixed with straight epoxy makes a very tough coating, if difficult to spread and sand. Ideally, skegs and wooden rubs should be a dense hardwood, if only to tolerate more abuse. Yes, the reason it fails is because moisture get behind the plastic membrane and can't get back out easily. Breaches in the coating and fasteners are the usual routes, which is why I recommend bonding the fastener holes and regular inspections to keep up with minor dings and scratches. 304 stainless can work, but only in bonded fastener holes. In fact, I've never seen one corrode or fail if truly embedded in goo. 316 or 316L are much better choices, but usually special order or speciality stores online (McFeelys or FastenAll for example). The bronzes are also exceptional, though you'll pay dearly for them. Bronze and monel are the ideal metals for rub strips. They don't corrode easily and are tough. Again, both of these will make you cry when you see the price. Naturally, the fasteners need to match the strips used. Those screws look like they might have been zinc plated, not stainless. Hot dipped galvanized will hold up moderately well, with some rust stains to be expected, after a number of years. Zinc plated are mostly junk, as are the "coated" screws that are suggested corrosion resistant on the package. I tend to use a lot of aluminum rub strips on small boats. It's easy to machine, can be bonded down (epoxy) and/or screwed and though some corrosion will occur with stainless screws, it takes a while before the strip is compromised and it'll probably need to be replaced by then anyway. To stave off this corrosion, I usually put a dot of polyurethane under the heads, before I drive them home, thinking it'll help isolate the dissimilar metals. There are also purpose made flathead washers of teflon, that can do a remarkable job of isolation too, if you're really worried about it. I do this on mast tracks sometimes, but not usually a rub strip. A well shaped hunk of aluminum, roughed in with a jig and a bandsaw, then fine tuned with some fines and a DA. I even radiused the edges with the DA. After it was drilled for fasteners it was polished up, There's a lot of shape to this strip, which is two pieces. The narrowest portion is at the aft end of the skeg, less than 3/4", it swells around the board slot, maybe 2.5", tapering back down to the stem and swells again at the stemhead, which it wraps around (over the top). This is some 5052 alloy, because I expected some saltwater use from the client. I'd use 6061 if it was above water and a structural element. Got the keel off. A couple questions. 1) There are screws every 2 feet or so. None corroded. Stainless looks like to me and some brass I think (copper colored where cut with the reciprocating saw). Not likely to get them out unless I dig. It seems like that would make a mess. Am I ok to epoxy over it and call it good? 2) I was going to put a layer of glass down under it but am wondering if it is necessary. I'm doing a decent job of keeping from hitting the existing glass. And the layer of epoxy that is there is pretty thick. If I can get that level, can I just put a new keel on the way? And how flat does it need to be? There are some pockets in the surface but it seems like they should fill in with the first epoxy coat? 3) looks like all the damage stayed away from the hull. Glad about that. Leaving fasteners in is always a risk, but use a magnifying glass and see if you can tell if they're really bronze, as this would be the only one's I'd leave buried like that. Will a magnet stick to any of the filings? As to another layer of 'glass, well if you can determine the quality and thickness of the previous layer and more importantly you trust it, just fix what's there and move to the next step. Any questions about the quality and thickness might force your hand the other way. Yep, as you've suspected, us wood butchers do this all the time and rely on thickened goo, to hide our sins. Under filler and paint, who's going to know. It sounds like you got lucky and caught things in time, which is the only goal in routine maintenance,. If this is the same guy who posted on Duck-works Magazine on FB, he has gone with nylon webbing epoxied over the keel as a wear strip. Ok. Removed the keel and tried flattening out the bed. I sanded through yomwood in a couple small spots. Ok to epoxy 2-3 layers, then glass tape the length of the keel and a few more coats of epoxy before putting the keel on? I'm going with Doug fir because that is what the local yard had. I found a nice clear 14' piece of 2x2 that I'll rip. The existing one was only an inch deep. And with the skeg it was only one more inch (and slightly narrower). Any thoughts on the making the keel larger or smaller? I don't have the plans since I didn't build it. But while I'm doing this, I might as well ask. Nice old growth hard Doug Fir? Not that wimpy white wood stuff that they claim is Doug Fir?. The CS-15 had a 4" skeg at the stern - I don't know what a CS-17 should have.